Ultrashort light pulse with stabilized optical phase. An ultrashort laser pulse is comprised of a few of these oscillations. (red or blue curve). Black curves: field envelope of the pulse. Maximum field strength is obtained if the field maximum coincides with the pulse center. (red curve). The newly developed method stabilizes the field pattern of the pulse. Two zoom-ins visualize smallest temporal fluctuations previously demonstrated (green frame, laser stabilization, 100 attosecond jitter) in comparison to those demonstrated with the new method of direct field synthesis (yellow frame, 12 attoseconds jitter). Lasers can now generate light pulses down to 100 attoseconds thereby enabling real-time measurements on ultrashort time scales that are inaccessible by any other methods. Scientist at the Max Born Institute for Nonlinear Optics and Short Time Spectroscopy (MBI) in Berlin, Germany have now demonstrated timing control with a residual uncertainty of 12 attoseconds. This constitutes a new world record for the shortest controllable time scale. Light is an electromagnetic wave of very high frequency. In the visible domain, a single oscillation of the electric field only takes about 1200-2500 attoseconds. Consequently, an ultrashort laser pulse is comprised of a few of these oscillations. However, pulses from conventional short-pulse laser sources exhibit strong fluctuations of the positions of the field maximum relative to the pulse center. For maximum field strength, the center of the pulse has to coincide with a maximum of the electric field, as shown in Fig. 1 as a red curve. 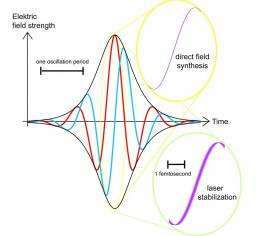 Consequently, methods have been developed to stabilize the position of the field maximum, i.e., the phase of the pulse. Together with Vienna based laser manufacturer Femtolasers, MBI researchers in the group of Günter Steinmeyer have now developed a new method to control the phase of the pulse outside of the laser. In contrast to previous approaches, no manipulation inside the laser is necessary, which completely eliminates fluctuations of laser power and pulse duration and guarantees a strongly improved long-term stability. Correction of the pulse phase relies on a so-called acousto-optic frequency shifter, which is directly driven by the measured signal. Dr. Steinmeyer is convinced: "This direct correction of the phase dramatically simplifies many experiments in attosecond physics and frequency metrology." Previously, stabilization of the position of the field maxima was only possible with a precision of about 100 attoseconds (10-16 s, corresponding to 1/20 of the wavelength), which is comparable to the shortest duration of attosecond pulses demonstrated so far. The new method allowed to push this limitation down to 12 attoseconds (1.2 x 10-17 s, 1/200 of the wavelength), which surpasses the atomic unit of time (24 attoseconds) by a factor of two. As the atomic unit of time marks the fastest possible time scale of processes in the outer shells of an atom, the new stabilization method will enable significant progress in the research on the fastest processes in nature. This success strongly relied on a close collaboration with laser manufacturer Femtolasers who provided a specifically optimized laser for the joint experiment and is currently developing products based on this new method.